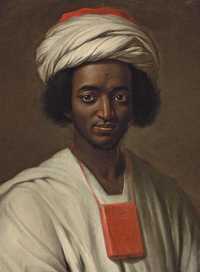 Back in August 2010 I posted news of the National Portrait Gallery's appeal to raise £100,000 toward the £555,000 needed to save William Hoare's portrait of Ayuba Suleiman Diallo (1733) for the nation (CLICK). At that time I wasn't sure whether the book dangling from his neck was the Bible or the Koran. It turns out he was Muslim, and this is the main reason his portrait was bought by the Qatar Museums Authority (QMA). From today, the painting is back on display at the National Portrait Gallery, London, in Room 15 (CLICK). But the museum didn't buy it. A deal has been struck with QMA to borrow the painting for 5 years. Sandy Nairne, NPG Director, has promised to return donations if possible.